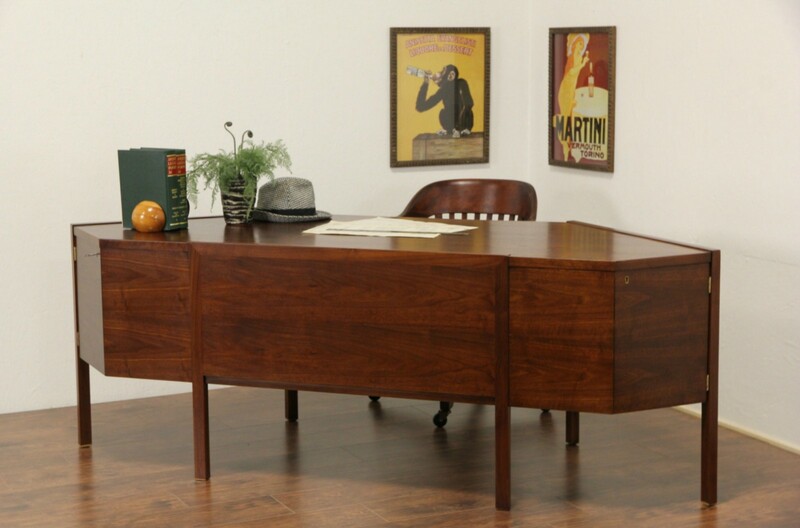 Signed by famous maker, "Dunbar," this Midcentury Modern executive desk has a striking angled shape that fits beautifully into a corner. The satiny finish is in excellent condition on matched walnut, the vivid natural grain shimmers darker and lighter depending on the angle of light. A wide drawer has a carved oak pencil tray but no key, side door locks and key do work on this American made vintage library furniture. Size is 81" long, 31" deep, 29" tall and legroom is 25" underneath.